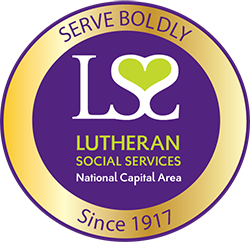 Lutheran Social Services of the National Capital Area has been operating for over a century. In 1917, a group of seven Lutheran entities pooled their resources to have a greater impact on the most vulnerable members of the Washington DC community. Over the course of our history, LSS/NCA has transitioned to meet the changing needs of society, while always staying true to the mission of walking with those in need to offer hope and compassion. The most notable events of our time--World Wars, the Great depression, the civil rights movement, women's liberation--have played an influential role in the needs of our community. It is here--at the core of every era--that LSS/NCA has found its place, always heading the call when others may see the challenge as too great. Today, we continue that tradition of service by resettling refugees fleeing war and persecution, building new families through adoption, offering homes to unaccompanied refugee minors, and empowering youth affected by HIV, mental illness, and substance abuse. Download our centennial history book--a complete overview of our program and agency development.